You could say human evolution started when the first brave ape came down from the trees. But scientists have long said that it was making tools that really set humans apart. "Everything that made us human was arguably given this big push by using stone tools," Williams says, "and so I'm trying to see what it is about our anatomy that allowed us to be good at it compared to other species that weren't good at it." I heard this interesting story yesterday. As the above quote indicates, scientists believe that our ability to make tools helped us excel where other species did not. And of course as everyone knows, our thumbs set us apart. But of course apes have thumbs as well. In studying how humans succeed and apes fail at chipping flint with stones, it looks like a thumb isn't all you need. Turns out the apes thumb is a bit small, and the strength in their hand is more vertical (which allows them to support their weight hanging from branches). The human thumb is longer, and the palm of our hand has more side-to-side strength, which helps us grip the striking stone better. And oddly enough, the lowly pinky comes in to play. This all reminded of a group camping trip some years ago. Our friend Brent was convinced it wasn't only our opposable thumb that set us apart from the rest of the animal kingdom. 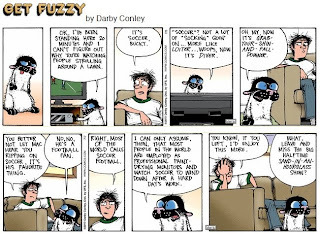 Now, he has a lot of random theories and ideas, most of which are pretty out there (zero-gravity veal anyone). To prove his point, he talked most of the guys and one of the women into duct taping our thumbs down to make them unusable. We spent a good five hours with our thumbs taped down. From what I recall, managing our zippers was one of the more difficult hurdles. But we managed to prepare our meals including cooking steaks over the campfire. We could feed, if not clothe ourselves. It was a pretty entertaining evening. At one point, I looked around the campfire and realized that I was the only one left with duct tape around his hands. I'm not sure if that makes me more determined, resourceful, or just more easily duped into goofy experiments. I am sure if a Park Ranger walked up, my friends would have sold me out. "I don't know sir, he does these odd things from time to time." Friggin Brent. Programming note: I was telling a story up in Washington to someone who did not know my friend Sean H down here in California. When I talked about "Sean", he thought I was talking about myself in the third person. When I refer to "Sean" here in the blog, I am talking about my friend Sean H. I am not speaking in the third person. I hate when people do that. It helps to have a running buddy. Even if they aren't running there with you, they are still part of your support system. 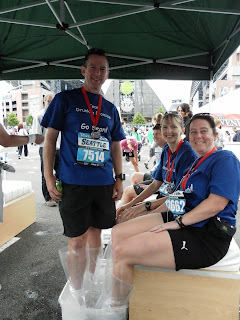 While I was training for my second marathon, I was training alongside three other friends who were preparing to run their first. And since this was my first pass through a full marathon training program myself, we were all breaking new ground together. We ran at different paces, but during the 16 week ramp up we still met every couple of weeks to do our training runs. We weren't necessarily running next to each other, but we were still more or less running together. We'd meet before and after to talk about how training was going, as well as catching up on everything else. When we stood together at the start line of the 2007 San Diego Marathon, we were truly a running group. We ran the first mile together before splitting off to run our own race. It was really a great experience. Ever since that race, I haven't really gone through a training calendar with anyone. I have certainly joined friends at races, but I haven't had as much of a connection during the build up. I have mostly trained alone, and when we show up together at the start line, there is less of a sense of a shared journey. This time it is a little different. Sean and I are both training for an October marathon. We are not running the same marathon, but since they are only two weeks apart, our training schedules are roughly aligned. But we are actually going about it in two different ways. I described my plan in a previous post. 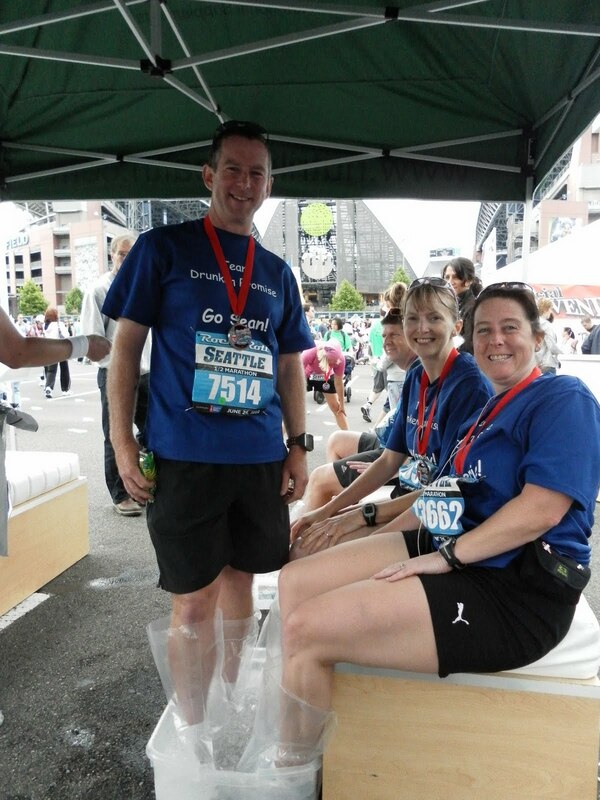 Sean's plan was to run every day this month to develop a base, before starting in on higher speed and mileage. His July runs were not necessarily fast each day, but every day he would put in at least three miles. He would ramp things up for a long run each weekend, but July was mostly about making running an unquestionable routine, rather than a chore. It sounds like a great idea, but I think I will wait to try it out when I am not training for something specific. Now that Sean and I are working together most days, we share our training stories after almost every run. Anytime I am tempted to postpone a training run, I remember that I have to "report" to Sean. It keeps me honest, and in waiting to hear how his training is going, it keeps me interested on another level. It is good to have a running buddy again. And I can't wait to see how our different methods pan out in October. And of course having a buddy helps in other journeys as well. I have a friend that has been using Weight Watchers for a few months (quite successfully I might add). She has a friend who has been through the program who has been of great help. At the beginning, they were talking on the phone daily, discussing points, meal plans, etc. I think having someone who understood exactly what she was going through helped tremendously to get through the first week or two. So many of our struggles for improvement end up being all too solitary. It helps to have a buddy. Find one if you can. 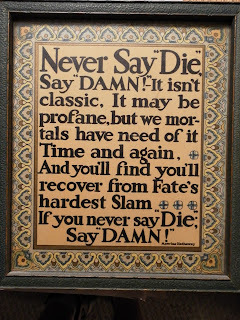 This was originally my grandmother's, and it now hangs on a wall at my parent's house. 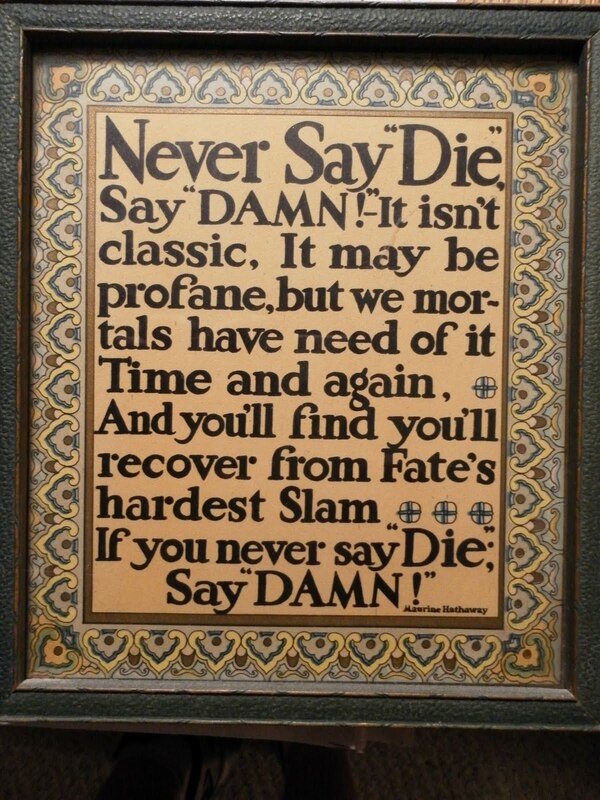 Never say die, say damn. I am about two-thirds of the way through Love is a Mix Tape: Life and Loss, One Song at a Time . 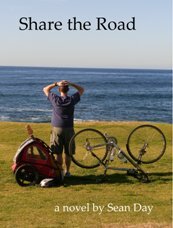 The book is a memoir about the author's love of music, the courtship and marriage to his wife Renee, and her all-too-sudden death after five years of marriage. He uses these mix tapes created by he and his wife to place himself at certain times in his life. The mix tapes serve as both a launching pad and a soundtrack to the story. The author's passion for music has reminded me how much it is missing in my life these days. I listen to much less music since I started listening to podcasts. The podcast list keeps growing, and I follow almost 30 on a regular basis, so it leaves little time for music. The soundtrack of driving, exercise, and odd chores is now filled up with talk instead of music. I love listening to podcasts, but I miss the music. I dragged all my CDs down to San Diego, two large boxes in all. A few people asked "why?" since I only had so much room in the truck, and music is largely digital now. But I have only loaded a portion of my music onto the computer, and my Nano can only hold some fraction of what I own. CD sales have been dropping for years. Originally it was a illegal downloads that were cutting into sales. The music industry did its best to fight it, with some success. Now of course there are many legal ways to downloads individual songs (iTunes, Amazon, etc. ), but by making it so easy to purchase individual songs, few people are buying the whole album these days. Like others, the iPod has also pushed me towards listening to individual songs, rather than full albums. And I miss this too. When I do chose music these days, I typically listen to a few playlists I have created, or just hit shuffle and see what comes up. But there is a real appeal to listening to an album. Some albums are structured to rise and fall, each song building on the one before. And there are the hidden jewels buried on side B (when there was a side B), songs you never hear on the radio. And if all you do is buy individual songs, you never have a chance to make those discoveries. So it is time to turn off the podcasts for a while to make time for music in my life. Less talk, more rock. The author had much more indy taste in music than I did, but there are some albums he mentioned that I have still buried in those boxes I dragged down. Time to dig through those boxes and put the CDs back in the car stereo where they belong. And like the author, I made a ton of mix tapes when I was younger. I still have them in my storage unit in Seattle, and even just looking them over will take me back to when I made them. Now I kind of wish I had them down here with me. Of course I don't know what I would play them on. You know how the air smells after the first rain in weeks. I love it! - so fresh and clean. I heard recently that the smell is different depending on where you live. When the rain falls, it hits the local soil and plants and releases a smell specific to the location. I was out for a run this morning, and it was drizzling. It may be the first time it has rained during a run down here. A scent was in the air, and I was having a tough time placing it. I finally figured it out. It smelled like Round Up weed killer. Bleh. On my long run last Saturday, I ran through Ocean Beach. It was pretty warm last week, so I tried to stay relatively close to the ocean to get some onshore breeze. As I passed by Dog Beach and the volleyball courts, I passed a gal heading toward the beach, clad in neoprene, carrying a surf board. Every time I run near the beach or Sunset Cliffs, I see lots of people bobbing in the water, astride a surf board, waiting for the next wave. Not the first time I have thought, "I'm in the wrong sport". "Camp kids explain how their non-camp friends and their non-camp loved ones have no idea why camp is the most important thing in their lives." "David Himmel is a college sophomore and a former camper who's now a counselor. He says all the best experiences of his life have been at camp or with camp people." ~ Descriptions of the first two sections of "Notes on Camp" by This American Life. I am one of those non-camp friends. I love to camp, and get out to the woods as often as I can, but I have never been to "Camp!" Most of my California friends met at camp - I have joined the group through one level of separation (Matt and I worked at a restaurant together). They love to tell stories about it, and it is clear that friendships were not only started there, but cemented there. Several of them continue to go back as counselors, and it sounds like they have as much, or even more fun as the campers. I will probably never quite understand it, but a This American Life podcast I listened to today gave me one more glimpse behind the curtain. It is a good episode, and the first ten minutes in particular help us non-camp people understand the appeal of summer camp. After my morning bike ride, I met up with Matt, Holly and Kristy at Wine Steals. Wine Steals is this casual wine tasting room located in Liberty Station in San Diego. Liberty Station is a former Naval training station on the north end of San Diego Bay. It was closed in 1997, and the barracks and other buildings have been redeveloped as shops and restaurants. Wine Steals is tucked away in one corner of Liberty Station, and sits just off the Sail Ho Golf course. As we pulled up a table on the patio, the morning clouds broke up and we settled in to enjoy the sun, scenery and wine. On Sundays, Wine Steals has wine flights for $10. The wine flight is six, half-glass pours of the partial bottles left over from Saturday's wine tasting. It is a great (inexpensive) way to sample a variety of new wines. The four of us split the flight, a bottle of white, and a light lunch. Later, we wandered through the station, primarily to pick some things up at Trader Joe's, but also to walk off some of the calories. Of course we were diverted by things both shiny and sweet. 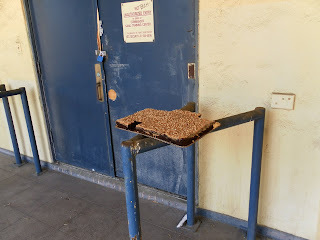 There was this random pan of brownies sitting outside one of the buildings. Without thinking, I grabbed one and took a bite. "What if they're poisoned", someone asked. Too late. I thought, 'that would be one silly obituary'. For those that didn't risk brownie poisoning, we stopped at Cold Stone Creamery for ice cream. Even with the bike ride, it was not to be a weight loss day. Kristy had to go home, but the rest of us were still up for something. Matt and Holly said "follow me", hopped in their car and headed north. 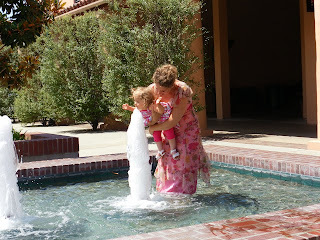 We ended up in La Jolla, a nice, semi-shwanky town along the coast. We wandered up the coastline along with the rest of the Sunday crowd. I guess there is a regular Sunday concert in the park, but we arrived a bit too late to catch it. There is a breakwater that was built to create a sheltered beach for kids. The harbor seals found it to be a great place for their pups as well, so now kids of both species have to share the space. Matt and I walked out on the breakwater for a closer look, and then headed over to the tide pools to see what else we could find. Matt experienced it the best when he opened him self up to the surf. A great day, start to finish. As a part of my new get-fit/training regimen, I finally dusted off my neglected bicycle. I wish that was a metaphor, but it wasn't. There was an actual layer of dust on the bike. I had only ridden it once since the move to San Diego, and that was almost five months ago. I took it out for a quick spin a week ago, only about nine miles worth, and I felt pretty rusty. Same goes for the swimming by the way, but I am getting back into my cross-training sports slowly since the nearest goal is still the marathon in October. I went out for my second ride yesterday and it was a little longer and a little more challenging. I am still trying to figure out good routes for the bike down here. That is one big advantage with running - it is much easier to find a good place to run. You're covering much less ground, and traffic is less of a consideration. You can run almost anywhere. Some roads are definitely better than others when it comes to bikes and cars sharing the road, and of course it is nice to find routes with fewer traffic signals. There was enough climbing to let me know that I have a long way to go before I am ready to join in on any local group rides. Don't want to get dropped on my first time out. 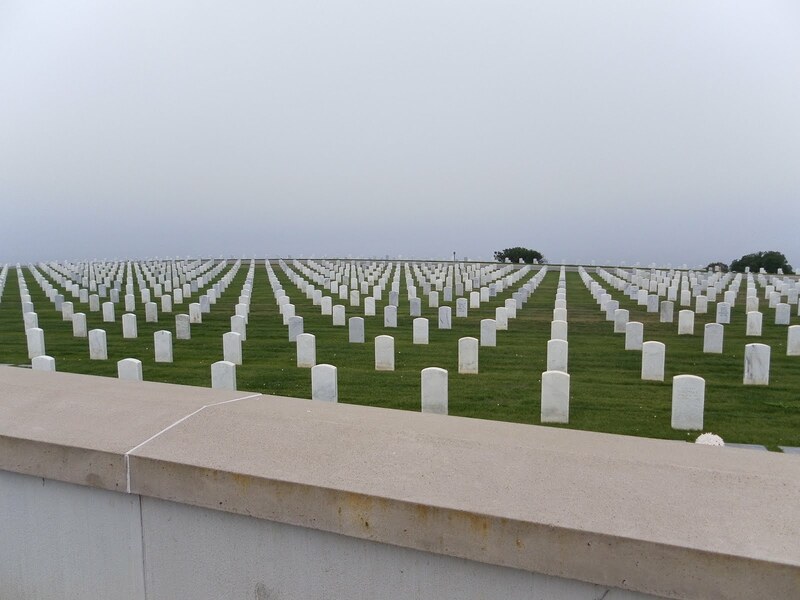 Just before reaching the monument, the road passes by the Fort Rosecrans Cemetery. 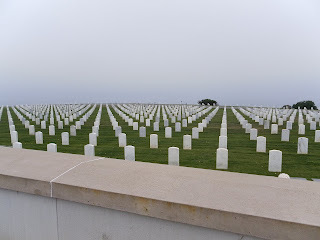 Actually the road passes through the cemetery, as it is on both sides of the road, and it stretches out to the cliffs overlooking the ocean. There is something about running or riding by a cemetery that I can't quite define. It is different than just passing by in a car. More personal. I can remember running by a cemetery around mile eight of the Eugene Marathon, and my thoughts turned inward. My mind bounced between the past and the present, and I thought about friends still here and those that have passed. It naturally makes me a bit reflective I suppose, and glad to be out doing something that I enjoy. Something that may keep me around to enjoy this life a little longer. I am heading out to Cabrillo again today, this time by car. It was all fogged in yesterday, and I would love to check out the area a bit more. I didn't stop to read any of the information on the monument, or check out the tide pools when I was there on Sunday. There was a bit of a time crunch since I was meeting up with friends afterward, and I'll talk about the rest of Sunday in the next post. One of the more difficult aspects of training so far has been the time I get out to run. Let me start by saying, I am not a morning person. Never have been, probably never will be. I can go for years working at a job that requires me to get up at 6am every day, but it doesn't get any easier. I set an alarm every day whether I need to get up at a certain time or not, because it is supposed to help to get up at roughly the same time every day. My body will always want 2 - 3 more hours of sleep, and given the chance, I would probably sleep in until 9 or 10. Because of this, I much prefer to run in the afternoon or evening. I barely want to get out of bed, much less get up early to get a run in before work. But that is exactly what I am doing these days. It is just too hot to run in the afternoon, and it is only going to get warmer over the next couple of months. It does feel good to get it out of the way early in the day, because sometimes your day can go sideways and training gets postponed. But that is small motivation when the alarm is going off early in the morning. Even with getting in my runs in the early morning, the heat is still having it's effect. It is recommended that runners calculate their sweat rate, in order to know how much water and other fluids to take in while exercising. I have never bothered to do this before, but by seeing the salt lines on my forehead after runs, I figured my rate was relatively high. Tuesday morning, I was weighing in anyway, so I decided to do the calculation. Basically what you do is weigh yourself before and after exercising for an hour. The amount of weight you lose is basically the amount of water you lose through sweating. There is of course some calories burned, but it is generally small compared to the weight of water loss. Tuesday was an interval workout, so I would be working a bit harder than normal, but the duration was under 50 minutes so I thought it would be a decent test. The results? After 48 minutes of exercise, I lost 2.5 pounds! Even though I was drenched with sweat, I was pretty shocked at the amount of weight loss. 2.5 pounds lost equates to 40 ounces of water lost, which means that I should be taking in about the same amount during exercise to avoid dehydration. Previously, I have not bothered to bring any fluids along for runs under 60 minutes, but I obviously need to reconsider. I should also be stopping to drink more often than I have been on any run. Running in California is obviously warmer than running in Washington, so I am going to have to continue to make adjustments. The temperature during my run Tuesday morning was around 70 degrees, and temperatures during the day this week have been tickling 100 degrees. So it looks like I will need to get up even earlier to try to beat the heat, and bring along a canteen of water. #1 Guide to Social Skills - Being Yourself is Not the Solution. It's the Problem. Learn to Change. This time its serious. No really. Marathon training programs usually run around 16 to 18 weeks. I have been basically using the same program for each of my marathons so far. The last two I ran were ones I wasn't fully trained for, but I have been maintaining a fair base of fitness over the past couple of years. That is actually the thing I am most happy with. Signing up for these runs has helped keep me working out. 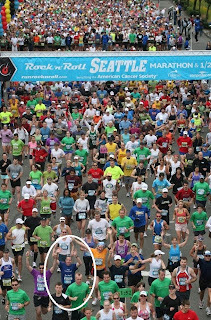 The last marathon I showed up fully trained and ready to run was the Seattle Rock n Roll Marathon a year ago in June. I did every training run, rode my bike once a week, and did some swimming as well. I mixed in a little "speed" work for the first time, which mostly consisted of treadmill intervals where I would speed up and slow down about every quarter mile. This program seemed to work relatively well for me, and I cut about 21 minutes of my best time. But I think that there is still some room for improvement. I want to qualify for Boston someday, hopefully by the time I turn 45. It gets 10 minutes easier at that point, but I would still need to run the marathon in 3:30. Though I have followed a formal training program in the past, I mostly ran whatever pace felt right that day. So I want to ramp up training for my marathon in October, to see what happens when I push myself. I have stuck with three runs a week in the past, mostly to avoid injuries, and I think that will work best for me as I ramp things up. My new training program is based on the F.I.R.S.T. program detailed in the book Run Less, Run Faster . The program has you running three days a week, and cross training at least two days. The theory is that the two days of cross training help maintain fitness, while reducing the amount of time you're pounding the pavement. The biking and swimming will also help me build a base for a triathlon later on. The pace of each interval depends on your marathon goal. My paces range between a 7:00 and 7:24 per mile. The Thursday tempo runs are also at a different, specific pace each week. The long runs each weekend are also run at a pace quicker than most programs. The one tweak I made was to reduce the mileage of the weekend long runs. The program had the miles ramping up quicker than I thought was sensible with the fitness base I had going in. The long runs will be a bit longer than in the past, though. So overall, it isn't a huge change in direction. I will be running the same number of days, but the plan is definitely more structured, and the mileage and pace are higher than before. After two weeks, I am definitely feeling more challenged. I am also feeling more sore however, and have been having some knee and ankle problems. So we'll see if the new program nets me a new PR, or sidelines me with an injury. In years past, I would record the 4:30am Tour de France coverage every day for three weeks. Coverage of the race is repeated throughout the day, but the early morning version had the most detail and the best announcers. I would try to watch it that evening, but daily coverage was often 4 1/2 hours long, and that is a lot of tv to cram into each day. It is exhausting trying to keep up! (he says knowing he sounds like a complete nerd). You end up looking forward to the rest days almost as much as the riders so you can get some rest yourself. This year, there is no DVR to catch the early morning coverage, and I just can't stomach getting up at 4:30am. Besides, I'd have to leave for work long before the race was over. We do get the channel though (which is kind of odd since we only get a handful), so I have been subjecting the housemates to race coverage nerdiness most nights. Like I said, I can't cast many stones at soccer or NASCAR fans. So, the World Cup final is tomorrow. Not that I have been following it. Have you? I do see it on many more tv screens than I did four years ago, but that may have more to do by my current location than increasing overall popularity. Soccer (or football) is like most any sport - much more fun to play than to watch. My brother and I played soccer as kids, and my Dad both played and coached. Now my niece is playing on an advanced select team, and is playing the unenviable position of goalie. As kids, we sometimes went to Seattle Sounder games and even saw them make the playoffs. But I can no longer sit down and enjoy watching a game. A big reason of course is that there is so little scoring. 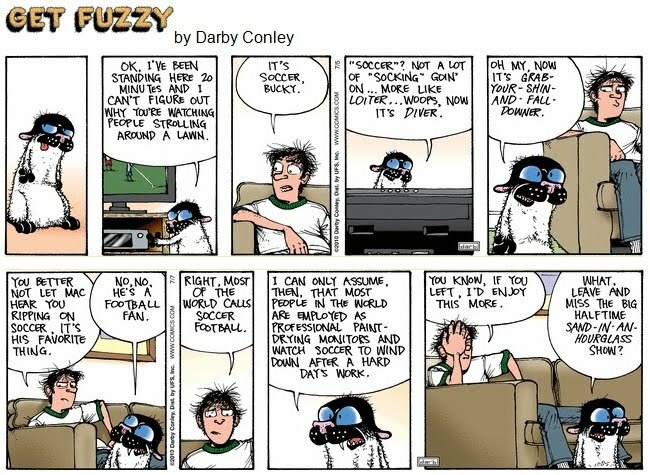 The long, loud shouts of "GOAL" are probably so dramatic because they are so infrequent. They have even introduced a ball that doesn't fly true in hopes that the goalies won't be able to stop it. From what I've seen, it hasn't helped much. So, the games are pretty boring, but the real reason is the all the dives the players take, feigning injury at the slightest touch. After writhing in (mock) pain and getting a penalty called on the other team, the bounce up and usually even forget to even limp to complete the act. If they spent as much energy trying to score as they do on their acting, they wouldn't need to make a funny-flying ball. Ah well, the rest of the world seems to love it. And I watch plenty of stuff other people find boring. I've mostly given up watching golf, but I try to catch as much of the three weeks of Tour de France coverage. Now that is some good stuff! But again, playing is more fun than watching. I think I'll dust off the bike tomorrow and go for a ride. I finished Animal, Vegetable, Miracle by Barbara Kingsolver last week, and it is a great read on an interesting topic. Even if you only read the first chapter, it would be worth your time. Barbara Kingsolver and her family move from Tucson to Virginia and decide to get their food as locally as possible. As one synopsis puts it, the book is "their journey away from the industrial-food pipeline to a rural life in which they vow to buy only food raised in their own neighborhood, grow it themselves, or learn to live without it." The book chronicles their first year of being locavores, and includes not only their own experiences, but lots of information on the environmental damage and resource waste behind our normal eating habits. One of the major points is that we have lost most all our connection to how our food is grown. It all just shows up shrink-wrapped in our grocery store. Most of us have little clue about how far the food has traveled, what chemicals were introduced, or even what the plants look like in the wild. Another point she makes, which is something I have thought about in the past, is that most people (including me) no longer know when fruits or vegetables are in season. Growing up, I remember that some fruits and vegetables were only in the store at certain times during the year. Now you can get asparagus almost any time of the year. But to make this happen, the vegetable often crosses half the world before it makes it to your table. According to the book, "Each item in a typical U.S. meal has traveled an average of 1500 miles." Another odd statistic that shows how little sense it all makes - we export 1.1 million tons of potatoes while we also import 1.4 million tons. When all the transport of food across the world is considered, there are far more calories of energy used to produce food than are actually contained in the food itself. The organic food movement has also taken a good foothold in the market. People are concerned with what kind of pesticides and other chemicals are used in growing their food, and what kind of health risk they pose. The chemicals not only pose some risk to us, but also can sterilize the soil so that it no longer will produce. Just this morning I saw an article, Coming Soon to Your Strawberries: Newly Approved Carcinogenic Pesticide. Methyl Iodide is used to "induce cancer in cell-culture experiments" and has been shown to "bind to DNA and cause mutations", yet it has been approved to be used as a pesticide in 47 states. California has its own approval process, and they are deciding whether it can be used here. There are many reasons to try to eat more locally, more organically, and getting to know the farmer that grew your food. People do it to reduce pollution and oil consumption, to eliminate chemical pesticides in their diets, to support their local community of farmers instead of shipping their money overseas, and for the simple fact that fresh produce tastes so much better than the well-traveled, shrink-wrapped version. Not many of us have an acre of free land to grow our own vegetables, but even people living in cities are carving out small areas to grow some food. An article in yesterday's Seattle Times details how much a woman living 15 minutes from downtown Seattle has been able to do. At our own home, Matt is currently making pasta sauce from tomatoes and basil grown in the backyard. The pasta will probably be served with a salad using lettuce from the garden as well. 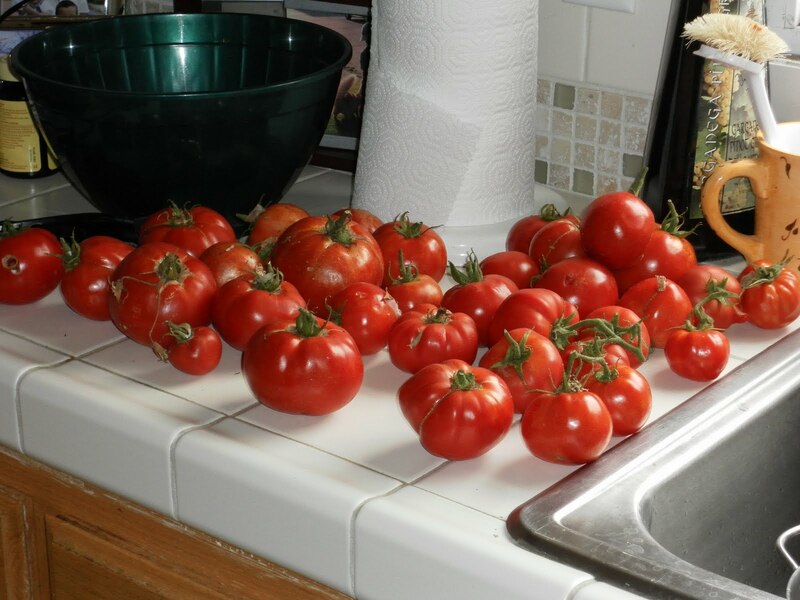 This is only a small portion of their harvest. They have enough tomatoes that they can give them away or even trade them to a neighbor for firewood. "If every U.S. citizen ate just one meal a week (any meal) composed of locally and organically raised meats and produce, we would reduce our country's oil consumption by over 1.1 million barrels of oil every week. That's not gallons, but barrels. Small changes in buying habits can make big differences. Becoming a less energy-dependent nation may just need to start with a good breakfast." I've enjoyed several books by Barbara Kingsolver, and I found this book to be a great mix of interesting stories and enlightening information. So, Tami calls me on the 4th of July and asks, "What's it like to be on the front page of the Business section?" Uh, what? 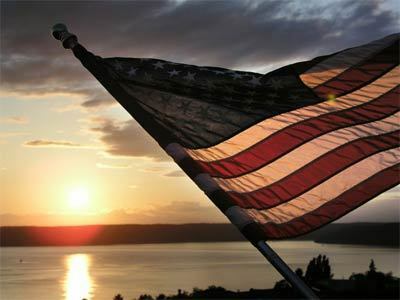 There was this article in the Sunday Seattle Times called Stressed out are running for their sanity, helping retailers. It talks about how more people are running and participating in events these days, even during a recession. Actually, that maybe more people are running because of the recession, and the running industry is benefiting. 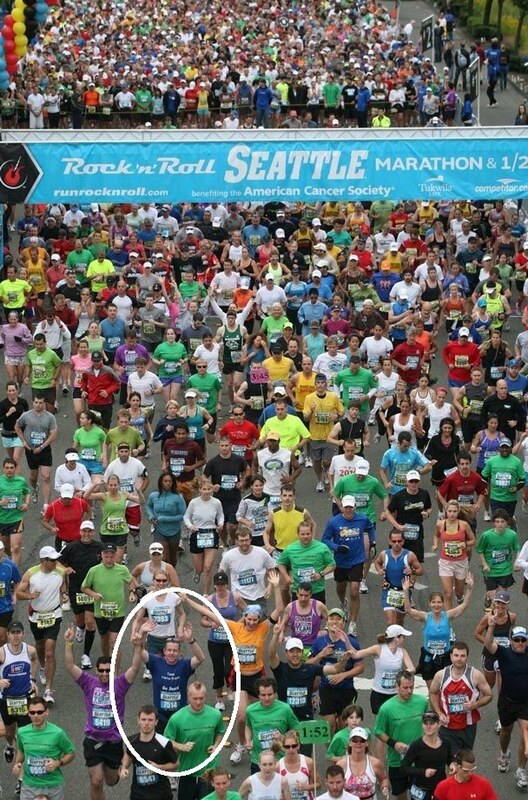 So I guess the picture that accompanied the article was a shot of the start line of the Seattle Rock n Roll Marathon. And there I was in the front row. Kinda weird, kinda cool. I did get a business degree, but this is probably the only way my picture will ever show up in the business section. A couple of interesting numbers (at least to me) about the Seattle Half Marathon last weekend. A recent article in Running Times quoted some statistics from Running USA about the growth of half marathons. In 1990, there were 303,000 finishers and the ratio was 75% male to 25% female finishers. In 2009, the finishers had grown to 1.1 million, and the ratio was now 43% male finishers to 57% female finishers. Apparently the gender flip (more women finishers) occurred in 2005. 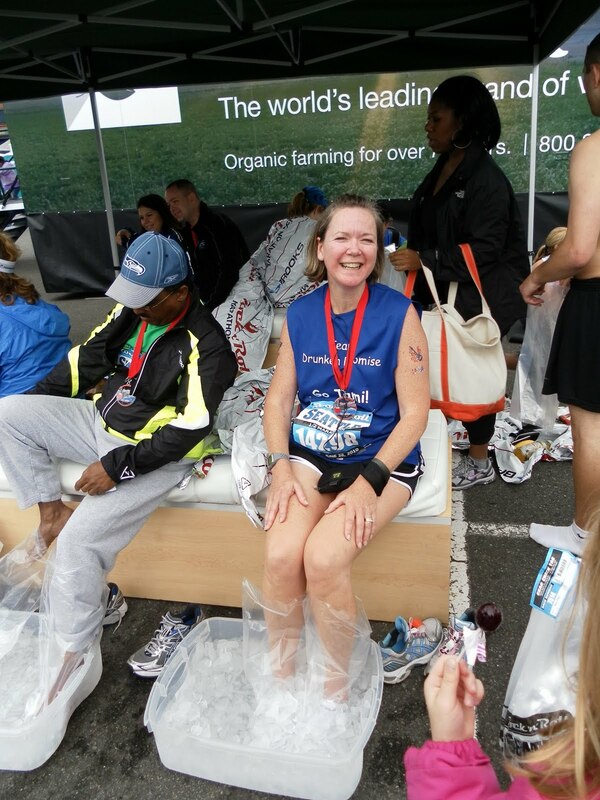 Out of the 17,608 half marathon finishers at the Seattle Rock n Roll Half Marathon, 12,572 were women, a whopping 71%! Pretty amazing. For the full marathon, it was almost a 50/50 split. The half marathon is starting to sound more attractive for a number of reasons. There are calculators online that will help predict finish times at various distances based on one of your recent races. One of them is here at marathonguide.com. Basically, you can plug in your finish time at a 5k and the calculator will spit out predicted finish times all the way up to the marathon. It assumes that you put in the necessary training and takes into account that you will run a slower pace at a longer distance. Obviously, the closer the distance you plug in, the more accurate the prediction. After the half marathon, I plugged in my finish time to see what the predicted marathon finish would work out to be. It spit out a 3:51:36 marathon finish. But more interestingly (again, probably just to me) is that if I plug in the finish time I ran at the Carlsbad 5k in April, it spits out a half marathon finish time within a couple of seconds of what I ran in Seattle. I guess the thing is pretty accurate. I didn't even need to run the half marathon - I could have just plugged in the numbers and asked the race director for my medal. On a side note, the half marathon was another well run event by the Rock n Roll folks. No complaints, other than the escalating costs of future events. The best part of the finish area was something sponsored by Nutrilite. They had a station where you could soak your weary feet in an ice bath. They had these plastic sleeves you put your feet in so your feet stayed dry and the ice bath could be reused. Oh, man it felt good on the weary feet. I have often imagined walking into the ocean after a marathon to numb my overworked muscles. This was the next best thing. If only it was a little deeper so you could get your whole legs in. Oh, and if you are interested to see what the Seattle half marathon course looks like, here is a course preview video from the website. Maybe it is a good thing that I didn't jump in line to be an early adopter of the iPhone 4. This is a rather major design flaw, especially when you are touting the design's improved reception. And what is Apple's response to consumer complaints? Essentially it "You're holding it wrong. If you can't stop holding it wrong, you can buy one of our protective cases (for $29)." Other, cheaper fixes have been suggested, including covering the line with electrical tape, or by surrounding the antenna with one of those yellow Livestrong rubber bracelets. Apparently there has been an increase of visits to the Livestrong site lately. And their new software glitch announcement doesn't explain why the signal drops when you "hold it wrong". If the software update lowers the bars for all iPhones past and present, is it just lowering expectations. Disneyland is the master of this. When you get in line and the sign says "1 1/2 hour wait from here" and it only takes an hour, most are happy about the savings of 30 minutes, rather than irritated at waiting an hour for a ride. Is Apple hoping that people will now say "look how great the iPhone performs with only two bars!" And the conspiracy theorist in me thinks, "hmm, has Apple been masking AT&T's poor coverage this whole time since they were locked in an exclusive agreement?" And now it has been announced that the iPhone will be available on Verizon's network in January, so maybe Apple is less concerned with burning the bridge with AT&T and trashing the strength of their network. Whatever. Apple will continue to sell hundreds of thousands of iPhones in the meantime. I wouldn't turn one down, and who knows, I may end up getting one after they redesign it for Verizon. But imagine the "I'm a Mac" ads that would be on tv if Microsoft responded to glitches like Apple has recently. I can already see John Hodgman as PC saying "just put some black tape or a rubber band on it. Problem solved!" And having him sitting at a table with an adding machine surrounded by paper, saying, "Ah, I see where the software calculation went wrong. I forgot to carry the one. Can't believe I didn't catch that"